Conero Park House, in the heart of the Conero Park, is a real estate with SEA VIEW with a plot of land, located in a stunning position. 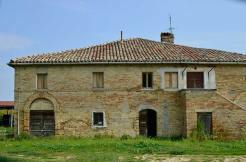 The real estate is composed of two houses with outbuildings and a plot of flat land over 4 hectares, where you can enjoy the view over the Adriatic Coast and the town of Sirolo. The Conero Park is a large area under the preservation of the region Marche, covers a surface of 6000 hectares, a beautiful green space on the Adriatic Coast, one of the most beautiful ridges, with its forests of pines, strawberry trees, oak trees and holm oaks, and hosts many wild animals that find there shelter; actually a precious place for anyone who loves nature. The farmhouse was built before 1967 and is composed of more apartments. The structure is strong, roof and fundations are in good state. The first apartment covers a surface of 146 square meters with kitchen, bathroom and sitting room, on the first floor there are three bedrooms and one bathroom, panorama terrace of 5 square meters. A canopy of 74 square meters. A cellar of 22 square meters. The second apartment covers a surface of 81 square meters and is composed of a kitchen, bathrooms, entrance hall, living room, two bedrooms. A cellar of 23 square meters. Building of 63 square meters with porch of 26 square meters. Building of 56 square meters used as shop. The plot of land covers a surface of more than 4 hectares (42.700 square meters), the whole surface is averagely flat and in a good panorama position. The plot of land is arable, and could easily be used to grow lavender or any other natural essence, or maybe to grow olive trees or a small vineyard. The real estate includes water, electrical and heating systems. The road is paved and the location is not at all isolated, though you can enjoy freedom and independence. The area is preserved by restrictions on new buildings that are not allowed, and it represents one of the best places for tourists from Italy and from abroad. POSITION: averagely 12 km from Ancona, the property belongs to the same Municipality, though it is also close to the town of Sirolo, which is only 5 km away. The road is one of the most beautiful, comfortable and panoramic of the whole region Marche. Shores: Portonovo, Trave, Sassi Neri, San Michele, Due Sorelle, La Spiaggiola, Spiaggia dei Gabbiani. All the shores can be reached by car, bus, by foot or by boat from the harbor of Numana. The area has high touristic value. Nearby there is the largest golf course in the region Marche (18 holes + 9 executives), where national and international golf tournaments take place and where you can enjoy a stunning view over the surrounding landscape. Cities of Loreto and Recanati, towns of Sirolo and Numana, and the old town of Ancona represent real pearls to visit and to discover. Historically the first inhabitants of those places were the ancient Greeks, that is where the names of Ancona and Conero come from, and more specifically the Dorians, the ancient Achaeans. WHY YOU SHOULD CONERO PARK HOUSE: this is a very rare real estate for its surface and the plot of land, located in a strategic position and touristic incoming opportunity. It could easily be turned into a farm, thanks to its good price, chosen for you by the team at Marche Country Homes. This real estate is sold exclusively by our Real Estate Agency.